Back in March, I participated in a Carnival of Genealogy topic of "Tribute to Women". 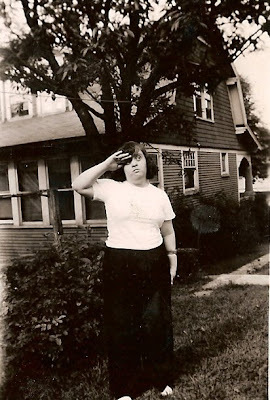 I posted about my dad's sister, Marianne (1930-1978), who had Down Syndrome. Well, someone from Temple University's Disabilities Studies BLOG read the Carnival at Creative Gene and posted a comment. From there things have been very exciting for Marianne. I'll make a long story short, but the post on the Tribute to Women Carnival caught the attention of a professor who was working with an organization called Facts on File. They are working on publishing a three-volume encyclopedia on the History of Disability in America and hoped to use one of the photos I'd posted on my blog in their work! 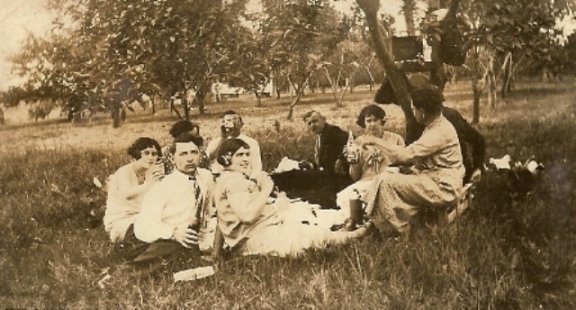 They were impressed, apparently, with the manner in which she was raised as part of the family and even often the center of attention. Today I granted them permission to use the photo in their project (to be published around June 2009), provided that I maintain the rights to the photograph, a condition to which they agreed. It is my hope that the encyclopedia will help educate America to the value of people with disabilities and raise awareness to the inequities that they have faced and continue to face. I'm so proud that Marianne will be part of that endeavor. While this is not the photo they chose for the section including Marianne, it is representative of the fact that it is I who should be saluting her. Whenever I browse through old photographs I find myself needing a reality check, as I struggle to remember that only the pictures were in black and white, not the people and scenery themselves! The pictures on the top are from the DOYLE lines. On the left is a photo from the earlier part of 1900. We believe the young girl sitting on the lap of the mother is my maternal grandmother, Regina DOYLE. 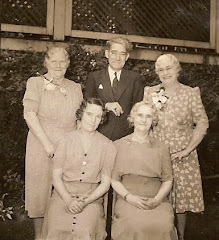 On the right are my great-grandfather John Doyle's sisters Margaret, MaryAnn (Mame), Alice and Johanna. Thanks to my cousins who sent me these photos. We don't know who is in the photo on the bottom right. 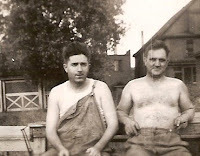 I suspect it might be my father's dad and his sister, Annie. Only because the man looks like my grandfather and the woman does not look like my grandmother. I could be terribly far from the truth, however. The photo on the bottom right, I believe, are four of the HODICK men, which were William, Anthony, Thomas, Frank and Edward. If this is accurate I would bet that it's William that is missing, as the stories I've heard depict him as a lone wolf of sorts. I stole an idea from my friend, Donna of Waiting for Lauren Elizabeth and yearbooked myself and my mother. It is a fun site, though I had a hard time finding decent headshots that were looking straight ahead and didn't have bangs (I haven't been without bangs since first grade). Bangs makes some of the results look rather funky. But here goes! Mom's turn! She was only about 10 or so in the photo I uploaded. So, geneabloggers and others, I challenge you. And yes, they do have a male "prototype" to use! If you try it out and post it, send me your link by September 30 and I'll do a run-down of participants. I guess it's my turn to do a collection of articles! http://www.yearbookyourself.com/. Sheri Fenley of The Educated Genealogist and Bill West of West in New England have awarded me the I Love Your Blog award. It always makes me happy when I hear people enjoy my blog. My task now is to find seven other blogs that haven't received it yet and nominate them. I'm going to choose some blogs that are newer to me and hope they haven't been chosen. If they have been, it still doesn't hurt for them to know others like their work! Click on the blog titles to be taken to their sites! 3. Tracking Thomas, and More If you love old photos like I love old photos, check this site out! 5. Tarenne's Tales This blog tracks a family of a child with Down Syndrome. There are so many other blogs that deserve this too. Go out there and find them! 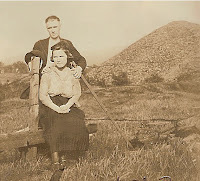 Terry Thornton of Hill Country of Monroe County has posted a challenge to the geneabloggers. There are lots of challenges put to this group! He wants readers to get to know each other and each other's blogs as well. So this post will tell you a little bit about me, a little bit about OMcHodoy, and a little bit about my blogging history. Let's start with me, Colleen McHugh. 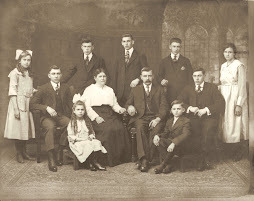 I started doing genealogy about 4 years ago after taking the old family photo albums from my niece for a little bit to reorganize and scan the photos. I was amazed at all the great photographs in that collection. Oddly enough, the ones I fell in love with the most were the oldest ones that are black and white or sepia. The true treasures are the ones that are scratched and dusty; there's something about them that makes the passage of time real yet romantic, if you will. In real life, I work as a social worker at a Children's Clinic, where we treat children with various medical needs, from the more mild hearing impairments to the more severe Muscular Dystrophy, and lots of diagnoses in between. I've been there about 15 months. I usually love my job ;). As for OMcHodoy, that name came about while trying to combine the surnames of my grandparents. The name is explained at my Oracle of OMcHodoy blog, found HERE. When a friend of mine suggested I create a blog, I didn't see the point. But I couldn't let the bandwagon pass by without me on it, so I did. And I'm glad I did. My goal was to chronicle my research, good or bad, mistakes and all. Overall I think it has accomplished that, but moreso, it has helped me connect with relatives I either lost contact with or never "knew" before. I find this aspect of blogging to be fascinating and what makes it most worthwhile. Terry has asked us to include our "Best of the Best" posts. Since this blog is relatively new, some of my favorite posts will be from my Oracle blog and some will be from here. So let's see if I can come up with my three best posts. 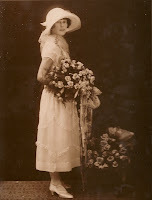 The brightest of my posts, I think,are those that show the processes of genealogical research. First there's the introduction of information: a document, a photograph, a story. From that information comes analysis of the information; particularly if there is an unknown factor in the information. Who is in the picture? 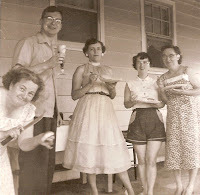 If unknown, what does the picture tell us in terms of era/time frame, clothing, activity? Is there documentation to back up the story of the couple's marriage? 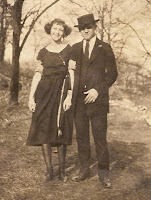 Through the analysis come possibilities: The clothing worn shows perhaps it was the 1920's, could this be grandma Hodick? Once you have some possibilities, the research process begins. Let's search for "Sans Souci" to see if that tells us something about the photograph labeled "In Detroit". Sometimes the research gives you answers; sometimes it only gives you more questions. So the posts below, all from my Oracle blog, show the cycle of processes that come from a genealogical find. **The first post, dated 7 Dec 2005, was entitled "HOWEVER". ** Next, posted on 5 Jan 2006, we have The Disappearing DOYLEs. ** Posted on 7 Jan 2006 there is The William and Nellie Effect. ** The follow up to The Disappearing Doyles was posted 10 Jan 2006, The Appearing DOYLEs. There are many more of these types of posts, but if I listed them all I'd be writing this post for a week! 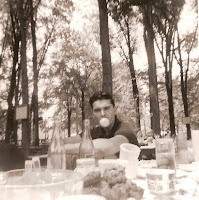 For the funniest, "breeziest" of my posts, I'd have to choose Blog Takeover, posted at Orations on 26 Jul 2008. This post was "done" by my dog, Izzie. If you wish to know how obsessive I am about my dog, I have 892 photos of him and he has his own blog. When I finally go on vacation next summer, I'm going to go crazy with worry about him! Finally, the "most beautiful" of my posts. This one was easy. I choose "A Tribute To Women", posted on 9 Mar 2008. 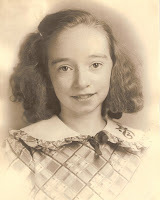 The subject of this post is my dad's sister, Marianne McHugh (1930-1978). Of all the ancestors and relatives I have studied, she is the one whom I wish I had known better. Everything I hear about Marianne is uplifting and upbeat. I suspect she had a lot to teach the world. And hopefully within the next year, she will teach the world a lot, 30 years after her death. Stay tuned for an exciting announcement that will give Marianne a chance to be part of America's history! What do I expect readers to take from reading my blogs? I hope they will learn from my thought processes; even the ones that didn't pan out. I hope they will learn that connections to cousins in modern times have meant more to me than learning someone's identity, or the date they were married. Most of all, I hope they enjoy the experience as much as I enjoy reading about their experiences!